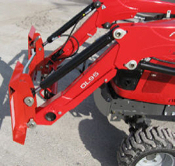 We offer hundreds of different quality products in these categories: Grounds Maintenance Equipment; Tools; Tire Changers And Wheel Balancers; Tractor And Skid Steer Loader Attachments, and Truck Accessories. For Befco, Mclane, York, parts, click the products by name link above. Please refer to the item page for shipping method and cost; most items are plus shipping. The order system will calculate shipping charge at checkout, to get a shipping quote, complete the order form and the system will show your total cost, then enter payment information if you want to order, or simply exit the system before you enter your payment information if you are not ordering. Extra services paid on truck shipments (lift gate for example), if actual costs are less that what was paid at checkout, you will be refunded the difference. Payment can be made by credit card for U.S. orders up to our limit of $1500.00, all amounts above this must be paid by check, money order, bank wire, or financing. Click any of the three financing buttons on the menu to the left, or scoll Down On This Page and use the links for these companies below. (Finance Programs Offered Third Part Providers, Please click on the links to apply and see current rates available). Click the link above on the left side of the screen for a financing quote from Direct Capital Company.